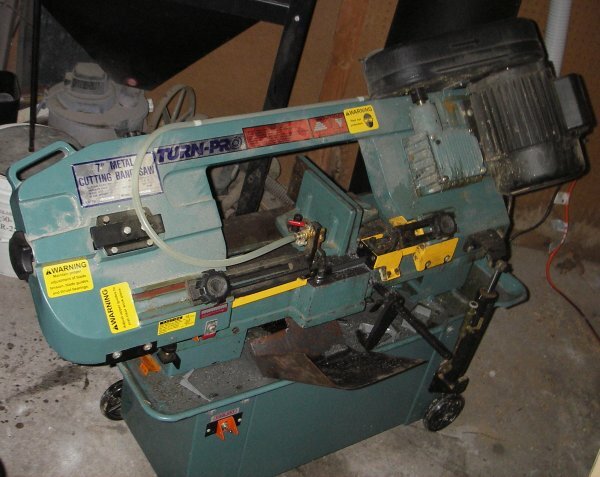 The Turn Pro 7" Metal Cutting bandsaw. When doing fabrication projects, probably my second most used piece of equipment. This band saw also flips up and has a table that bolts onto it so it can double as a vertical bandsaw. It cuts both wood and metal equally well. Only complaint is the cooling jet makes a mess because the nozzle is too close to the valve and it tends to spray instead of flood cool... and gets everywhere. You can see the "spray shield" I've made to reduce that... but it still tends to form puddles after alot of use.